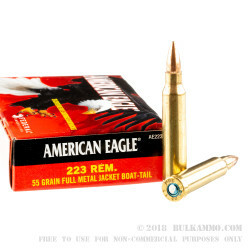 This 223 ammo is manufactured by Federal under their American Eagle line of ammo and provides a high quality option for shooting your AR-15. 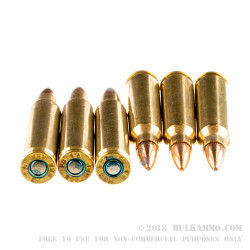 This brass-cased ammo is reliable in a wide range of AR-15 platforms and since it is loaded to 223 specs can safely be shot in either a 223 or 5.56 chambered AR-15's. Out of their test barrel, Federal shows a muzzle velocity of 3,240 feet per second although depending on your barrel length your results will differ so we recommend running a chrono on these yourself for those who like to geek out. 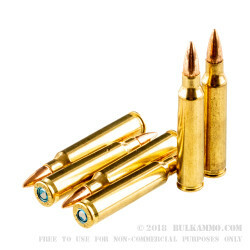 This high grade ammo is very dependable and is a main stay for high volume shooters looking for quality practice ammo or want to stash some away for a rainy day. This ammo is loaded in Anoka, MN and is reloadable, non-corrosive, and will not attract a magnet. Good ammo, would buy again. Flawless, Shot it all up in a rifle class. Q: My new rifle says to use ammo with no corrosive primers, and to look for ammo from companies that are members of SAAMI. Where will I find this info ? A: This ammo meets SAAMI specs and is safe to fire from your rifle. A: This product meets SAAMI specs and will be safe to fire from your rifle. It is non corrosive. Q: Is this lead core? A: Hello Jon! 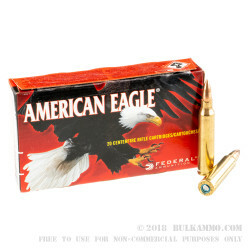 This Federal ammunition is loaded with a standard 55 grain FMJ projectile. The projectile is manufactured with a lead core and copper jacket. Q: Pictures show crimped primers. I usually buy 223 instead of 5.56 to avoid the crimped primers. Are these primers crimped? A: Hello Turk, The Federal .223 ammunition does not use any crimped primers. Federal only uses crimped primers in their 5.56 ammunition that is manufactured at the Lake City plant.